This law firm is active exclusively in the field of criminal law and non-criminal offences throughout Germany. We deliberately refrain from taking on cases in any other legal domain. As necessary in case of interdisciplinary legal problems, we cooperate with other law offices and tax consultants. In every stage of criminal proceedings, those affected feel under considerable strain. Comprehensive consulting provided by this law office not only covers the consequences of criminal sanctions properly speaking but also the personal and economic consequences which regularly come along with this. This law firm is providing defence both to individuals and to companies. In addition, this law firm gives advice to and represents companies, associations, statutory bodies and individuals in all questions of law related to economic offences while having particular regard to the avoidance of any potential risk during preliminary consulting. As required, our know-how in criminal law is also made available to offices specializing in business law, or to tax consultants, auditors and insolvency practitioners. The rules applicable to appeals are another focus of this law firm's activity. Relevant publications and industry analysts highlight this firm as one of the leading criminal law offices, e.g., in JUVE, Best Lawyers, Handelsblatt, Focus, Legal500 or Nomos Kanzleien in Deutschland. Among other comments, these publications state: "Gercke Wollschläger successfully managed to further strengthen its reputation as a highly qualified criminal law shop." (Nomos Kanzleien in Deutschland 2014). 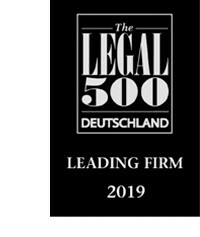 The special on "Deutschlands Top-Anwälte" (Germany's top lawyers – 2015) published by Focus magazine after extensive research conducted by the Statista Institute rates this office as one of the top law firms dealing with legislation related to business offences. 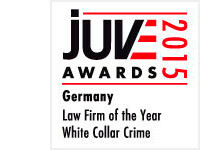 GERCKE WOLLSCHLÄGER is distinguished by the JUVE editorial team as "firm of the year 2015" for white collar crime; the JUVE award is certainly the most important award for german law firms.